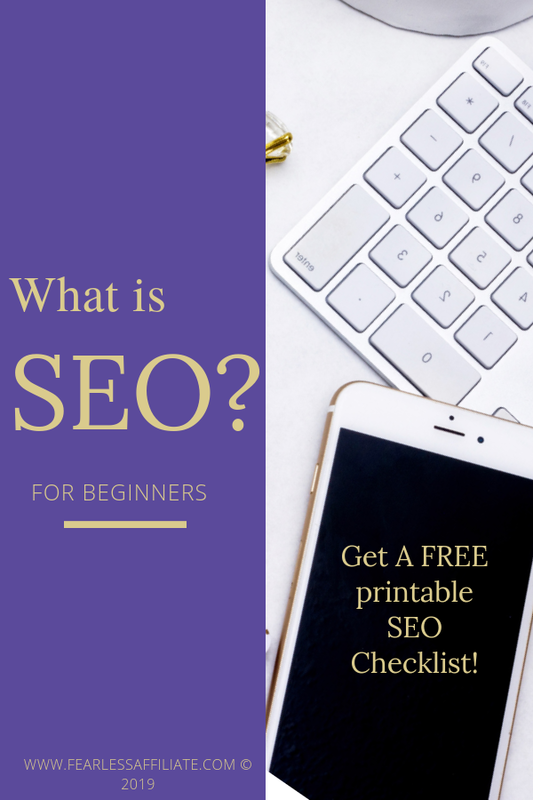 If you have been blogging for a while, then you have likely heard the term SEO or search engine optimization. But what is search engine optimization? Well is it your best way to reach the coveted #1 spot in search engine results. SEO is the practice of making your website and blog posts friendly to search bots, which sounds weird and creepy but I assure you it is not. As well, SEO practices help make blog posts easier to read by using heading tags, breaking up large paragraphs, using meta descriptions and more. The benefit to your website is that search engines will send you more and targeted visitors, which is what we all want. You get targeted visitors when your blog posts match the search intent of the people seeking help. Your visitors enjoy the experience of visiting your website and reading your posts, and you have figured out what people are searching for. Win-win. Be sure to bookmark this post and pin it for later and sign up for my weekly newsletter and free resource library by using the sign up box to the right or at the bottom of the page. Google is all about searcher intent. To understand this, let’s use the search term “apple”. If you type ‘apple’ into Google, you will likely get a ton of results for products made by the fine people who bring you iPhones and Mac products. Google is returning the most popular search results. But is that what the searcher wanted? What if you want to know what the best apple is to use in a pie? I tried adding the letter s to the end of ‘apple’. I still ended up with the iPhone producer in top spot, but in spot number two is a Wikipedia article on the fruit called apple. Close but not quite. Next I tried “pie apple”. Bingo! Lots of recipes and ideas for pies. While scrolling through the search results I found a fun idea for a pie, so I changed my search term to “caramel apple pie”. All my results matched that term which means those blog posts matched my search intent. Google does its best to return results based on what it thinks the user intent is. As bloggers, our goal is to figure out what our audience might search for and then create a blog post with help to match. SEO is easier with a strategy. I have created a one page printable checklist that you can download and print off every time you write a new blog post. It lists the steps that are in this post and can help you get in the habit of following the same steps each time you publish and it is in my resource library. Sign up for my FREE weekly newsletter to get the password to my library of free printables for bloggers. You will want to create a number of steps that you can follow and make a routine out of. Once you get the basics of on-page seo down (this post), you can move on to the off-page seo, which will be another post. I will assume that you have submitted a sitemap to Google. Visit this post from Google for more information on how to submit your sitemap. This is very important especially for new bloggers. Find 3 to 5 topics for your niche and use them as categories for your website navigation. Write blog posts that go into these categories, as well as any of their sub-categories. For an excellent article on structuring your website for SEO, I will direct you to this post from Neil Patel: How to Create a Site Structure That Will Enhance SEO. This helpful to visitors, making it easy to find more information on one topic. And it is helpful to you, as you can easily see which topics need more content on your blog. #winwin. This effects how you write your post and can be a request to click a link – either affiliate or an internal link – or a way to get more subscribers. Be sure to make the main link that you want clicked to be in bold text. You may have several links leading to the same place, so use the same link text. Make your call to action very clear to your reader. If you want them to sign up for your newsletter, then list the benefits of doing that. And put an opt-in box within your post. Make every call to action very obvious. Always assume that visitors have never been to your website before and have no idea what to do when the land on your page. Ask them to sign up. Ask them to click a link. If you have related posts, add links and direct your reader to go to the related post for more information. PIN IT! What is Search Engine Optimization? The words that are typed into the search box are known as Keywords, and they are an important part of SEO. As we saw with the example of the apple pie apples, you need to figure out how to best use keywords to match search intent. A single keyword, like apple, is too broad. In the example above, the term ‘caramel apple pie’ would be considered a short tail keyword because it is a phrase of up to 3 words. A short tail keyword more closely matches search intent, but is not always enough words. Sometimes it is more helpful to use a long tail keyword, which is more than 3 words. An example of this might be ‘crustless caramel apple pie’, which is more specific. Or ‘mini crustless caramel apple pies’, which is even more specific. Ideally, you will also want keywords that have low competition, making it easier for you to rank on page one right off the bat. Read the following post for more information on keywords and how to use them. Keep in mind that Pinterest is also a search engine – the third largest. It can be a good idea to use keywords found on that platform when doing keyword research. Might as well have all the help you can get am I right? When writing a post in WordPress.org you will see a text box in the toolbar titled PARAGRAPH with a down arrow. It is right under the ADD MEDIA radio button. Click in here to find the heading tags, or Htag for short. Highlight the text that you want to tag and then choose the appropriate tag from the drop down menu. The title of your blog post gets the H1 tag. This signals Google that this is the topic of the blog post. Only use H1 tags once, and within the first paragraph of your post/article. Introductions and sub-topics (using similar or related keywords) get the H2 or H3 tags. Structure your blog post using the Htags so that the reader can follow the progression of the idea from the title to the main idea to any bullet points or other logic to the conclusion. In theory, you should get the gist of the blog post from reading the headings. This is important for people who primarily use mobile devices to read blog posts. Keep paragraphs short and between 5 and 7 sentences. Readability is key. Repeat this process for all of your blog posts. When you add an image in WordPress.org, you can click on the image from the editor to bring up a small dialogue box. Click the pencil icon to enlarge the dialogue box and you can now edit the various areas. The top option is CAPTION and you can use this to add text under your photo. Be sure to use the title of your blog post with the main keyword. The next box is called ALTERNATIVE TEXT, and this is for visually impaired people. As well, the Google bots cannot read photos so you have to describe it for them. This is not an area to keyword stuff, but if the keyword is relevant to the photo make sure to add it. Help out the visually impaired by being descriptive of the image, i.e. “photo of an apple pie”. If you are using an SEO plugin for your website, such as All-in-OneSEO or YoastSEO, then you will have an area below your blog post that you can also optimize. Scroll down until you see a box with your headline in it and an area under it that you can edit. In Yoast, this is called the EDIT SNIPPET box. It might be called Meta Description. You get 160 characters to describe what your blog post is about and/or write a call-to-action encouraging searchers to click your post instead of anyone else’s. Use proper English and describe your post in a way that encourages people to click through and read it. If you are not sure what to write, or need new ideas, do a search in Google and read what other people write. Get creative, but remember that you are writing for someone searching for your information. Let them know that you have what they need. If you sell physical items or have a coupon code, this is a good place to mention it as part of your CTA (call to action). As you build out your websites content, you will naturally have blog posts that go together. Use that to your advantage to keep people on your site longer by leading them to read more of your awesome content. I like interlinking this way and I make the text for the words ‘Related Content’ bold. This makes it easier to find later. I also write out the full name of my blog post in the link, so readers know what they are clicking on. Google luuurrrrvvs interlinking. If you are going back through older content and updating, you can list a series of posts as related content at the bottom of the post. For example if you did a four part series, you can update part one and add links to part two, three, and four to the bottom of the post so readers can effortlessly move right to the next post and lessen bounce rate. Using too many plugins can slow down your website. It is a good idea to do a site speed test every now and again to make sure that you are keeping your website optimized. Try this one from Pingdom to check your website. Deactivate plugins that you only need once in a while. Slow websites are notorious for a high bounce rate. Visitors get tired of waiting for the page to load and they leave. You can avoid this by keeping tabs on your site speed as well as staying on top of any problems. This includes getting rid of ads (too many slow your site speed), deactivating plugins, optimizing images and making sure that your pop up is not slowing things down. Once you hit publish on a post, the very next thing you want to do is go to your website and grab the URL for that post and submit it to Google Search Console to be indexed. This tells Google that you want your post to be reviewed and ranked in the search engine results page (SERP). Go to the main search console dashboard and click URL Inspection and/or paste your blog post URL into the search box at the top of the page. It should say “Inspect any URL in…” followed by your website URL. You will likely see a box that says “URL is not on Google”. In the bottom right portion of the box it says “Request Indexing?”. Click that to send your blog post URL to Google for indexing. Submitting your URL more than once will not help it get indexed faster. It could take a couple of weeks to get your post indexed. It is a good idea to check your URL later the same day or the next day to make sure that it is now indexed. When everything is a go, you will see green circles with a check mark indicating that your URL has been successfully added to Googles queue. The search engine spider bots will crawl your post looking for clues on what it is about so that it can show the post to the most targeted audience. I suggest you pick your top 5 or 10 posts and monitor them after updates. Give them some time and see if they start bringing more traffic. SEO is not a one-and-done project, but an ongoing practice. If you do not like how your post is doing in the search rankings, you can go back and update it using best practices. Keep in mind that a percentage of your posts will do really well with traffic, and other posts will get almost no traffic. If you have optimized a post a couple of times and it is still languishing, then leave it alone. It just might be one of those posts. Good search engine optimization is a learned skill and using it is a long game. It can take time to move up the rank to that coveted number one spot. Thank you for joining me today and be sure to sign up for my weekly newsletter of tips and freebies for bloggers! Thanks for this post. It’s really helpful and I am going to come back to this post over and over again as I build out my site. I just ran a site speed test for my site. It’s saying mobile is 77 and desktop is 99. The issues seams to be images are not next gen. What does that mean and how do I fix it? I am not sure what you have set up for your website, so I cannot say for sure. There is a Next-Gen format for images, which is a new updated version of JPEG or PNG. They are JPEG2000, JPEGXR, and WEBP and they have better compression especially on mobile. I will direct you to this post from developers.google.com for more information. I have not seen that error message myself. thanks so much. I will look into this. Great article Irma, I really enjoyed reading it. 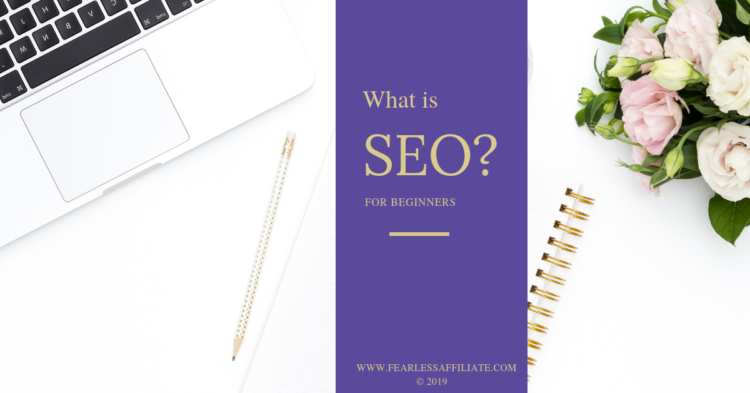 You have explained what is SEO and why people have to use it. I found myself that it is a lot better to target longer, more specific keywords with lower competition, even if they not that popular and don’t get as much traffic as popular and shorter keywords and I think it’s great that you advise this strategy to people. And it is very good that you have shared that submitting URL more than once will not help indexed faster. Thank you so much for sharing this helpful and informative post with us. Thank you Marius and thank you for visiting us today! That’s a great explanation about SEO. The topics are really understandable for a newbie like me. I really appreciate that you add links to it, which make it easier for me understand. I just checked my website with Pingdom and thanks to your help, I know now what to change. Thank you again for sharing this awesome content, I’ve learned so much. Hello, what a nice post you have here on blogging. I am a blogger but i have learned a lot from this post of yours especially around the area of search intent. You elaborated so well that i now know some stuffs i never knew about. Thank you for sharing such an informative pôst. You are welcome and thank you for visiting us today! All of this information is extremely helpful. I’ve been thinking about starting up a website, and having this knowledge could be the difference between success and failure. Thanks, will be following for more tips! Thank you Mallory and thank you for visiting us today. I wish you the greatest success with your website! I must thank you for this very insightful and useful post! I am at the point where I need to optimize my website for SEO and this is very timely information for me. It’s a lot of steps to success in this business and having your website as a resource is a definite boon. Thanks again for this valuable content. I am happy to help and thank you for visiting us today!